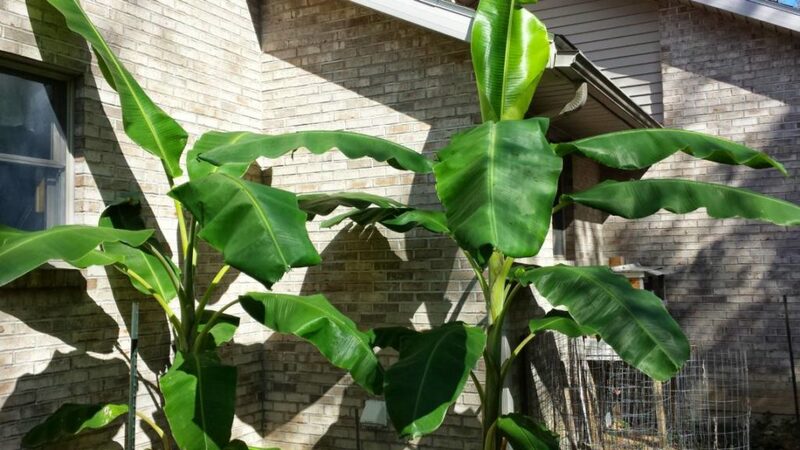 Bananas are tropical plants, but have you ever noticed someone in your neighborhood growing them? When we see tropical plants in an area they don’t usually belong, we have to wonder… how? Like growing anything, success comes down knowing about the plant you want to grow and then figuring out what is required to overwinter the plant. Is the plant meant to overwinter? Can it be done in the ground, or does it have to come inside? How cold does it get in your area? 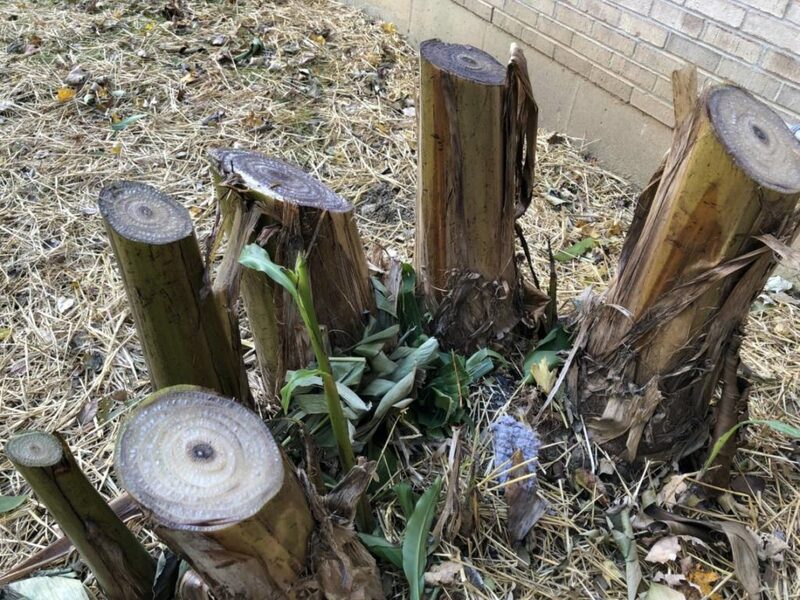 If it can overwinter in the ground, are there other precautions we need to take in order to ensure its success? 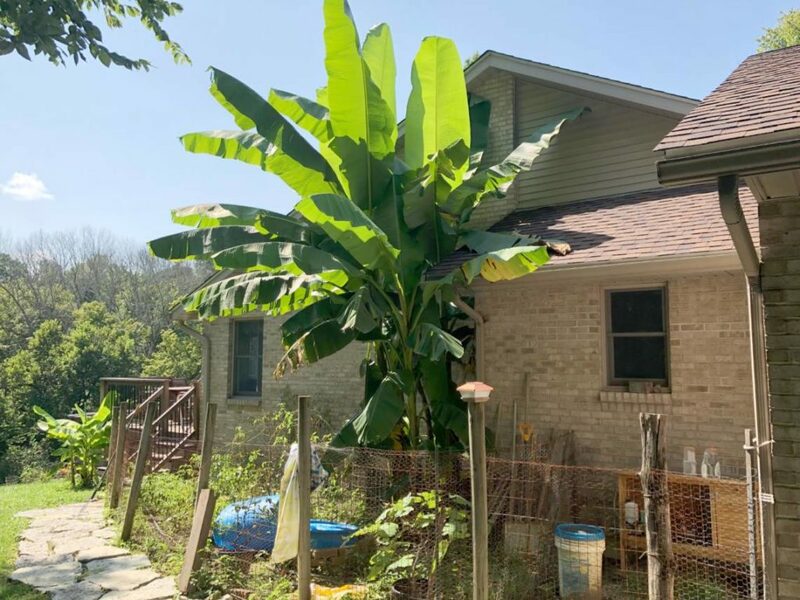 Today, we’re talking growing banana trees in Southern Indiana. That’s zone 6b on the USDA plant hardiness scale. and it basically means it gets darn cold in the winter where I am. 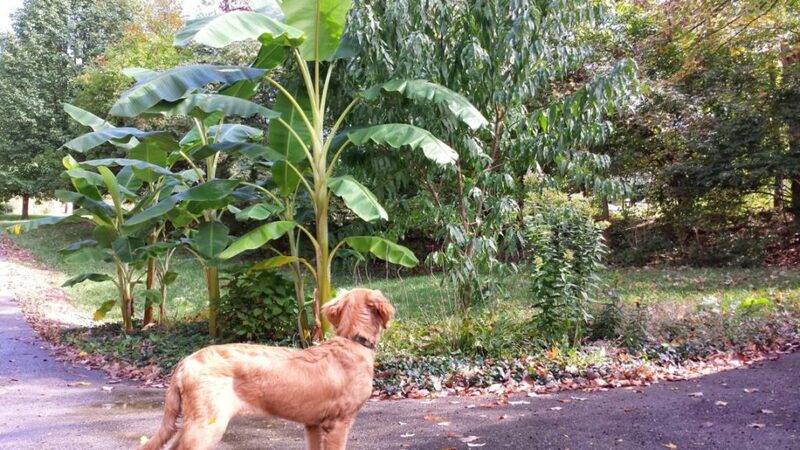 So how are we growing banana trees here? 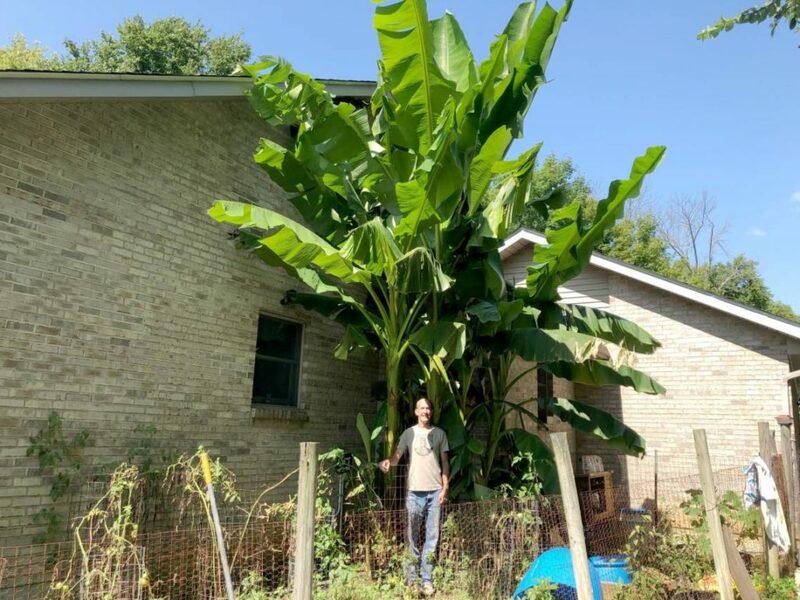 Well, I’ve been growing banana trees for the last 10 years. It started when a friend gave me a “sucker” or two. Bananas propagate quickly underground. Around the main tree, it can shoot up 5-6 suckers around it. 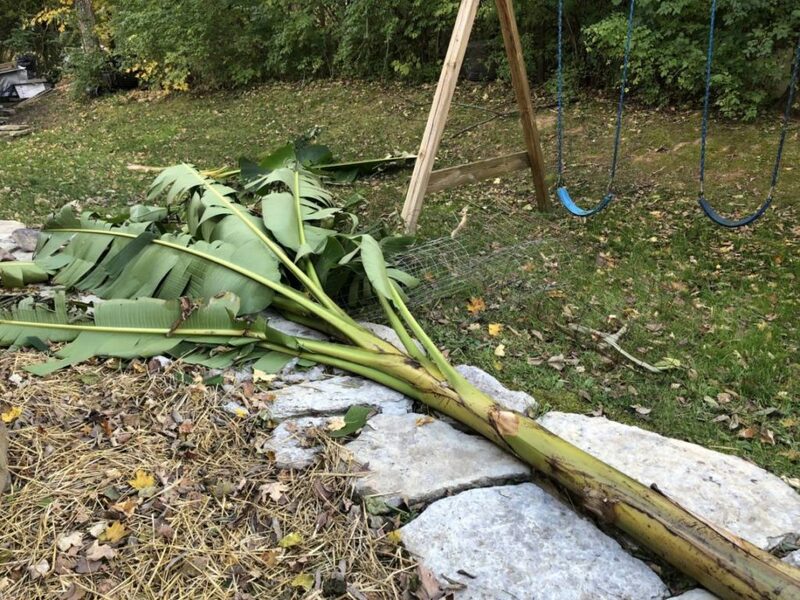 Once a banana tree blooms (i.e. produces a hand of banana) that main truck will die. But by that time, the 4-6 suckers around it are ready to go for the next season. If your tree really loves its location, it will eventually bloom. I like to see how big I can grow them. Sometimes, they will go t-3 years without blooming, and they get really big. Other times, they’ll bloom the first year. Trust me however, once you get them going, you’ll never run out. I find myself pulling some out of the ground just to keep my various “groves” under control. I let the suckers grow and gain some girth over a season to make it more easy to separate and give away. 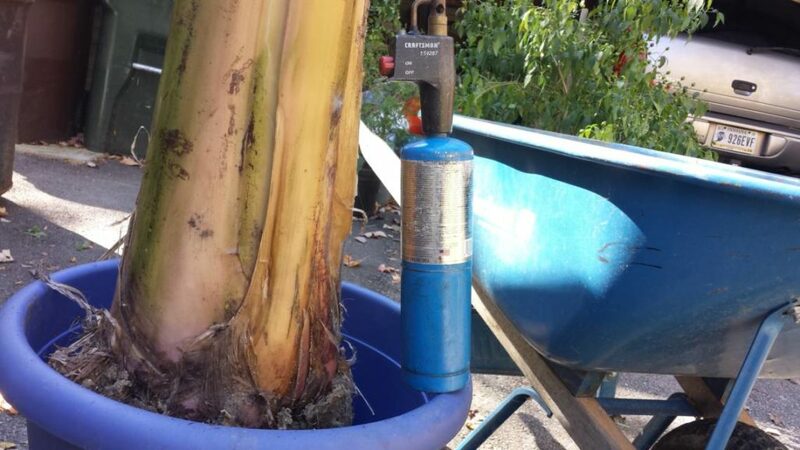 Banana trees have a lot of water inside and so they can keep pretty good after being pulled out of the ground. However, the skinnier the main stalk, the sooner it can dry out so I like to get them big so they can handle the process (and time) of pulling them out of the ground, getting them to others, and letting them have time to plant them. 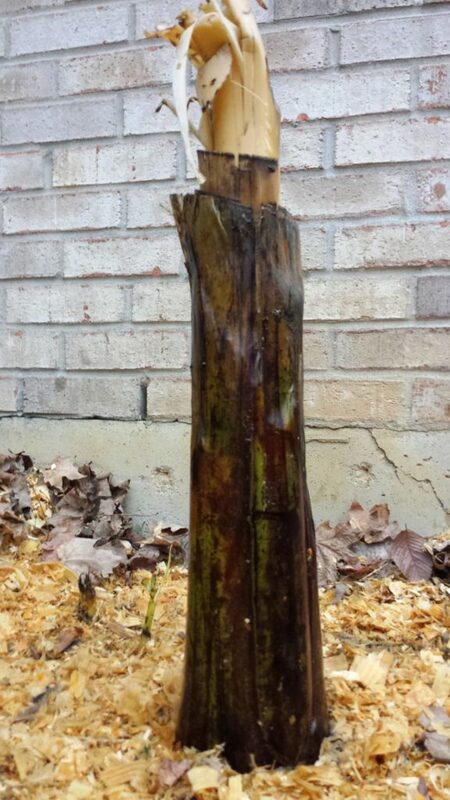 The banana trees I started with were not winter-hardy. I didn’t know they existed, and maybe they didn’t early on. I was required to dig them out of the ground around the first frost, bring them inside over the winter, and then replant them in the spring. Then, my brother-in-law acquired some winter hardy ones from someone he knew. Of course, I had to get some. Today, all of my trees have been replaced with the winter-hardy variety and I cut them and leave them in the ground all winter. The way I cut and winterize them takes a little more work, but in return, I get monster-sized trees, and plenty to give away. My brother-in-law would whack them just under the surface and mulch over them. Simple as that and it worked. However, come spring, we’d wait to see them poke out of the mulch and it would take time to gain it’s height. Experimenting… I played with hacking the trunks about knee-high. The height is really only dictated by what you have to cover them. Leaving them above ground gives them that much head start in the spring. 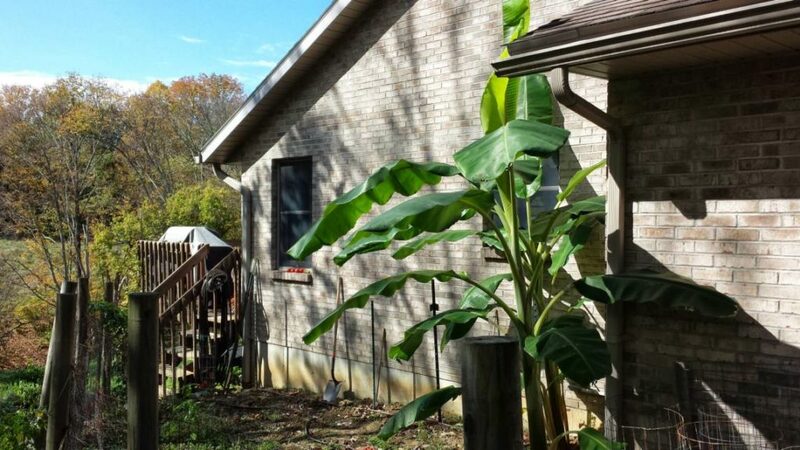 Bananas hacked and ready to cover for winter. 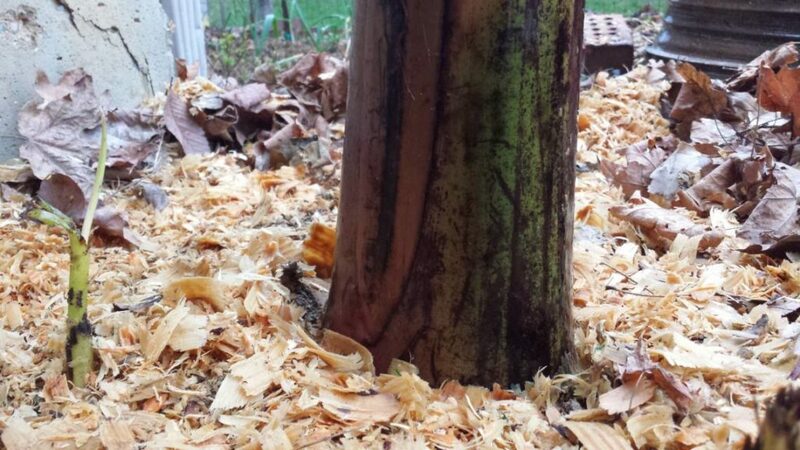 I use a machete, and I chop up the stalk and leaves and lay in my compost pile. The pile is HUGE by the time I’m done. I have tons of leaves in the yard each fall. I also keep my chicken feed bags which work very well because they are not like a plastic bag that would hold moisture in. Note, I have tried a kitchen trash bag, and it turned the trunks to mush. By the time I uncovered them, they looked decomposed and dead. They actually poked out new shoots around May or June however. So, they were not killed off, but they did have to start over. The chicken feed bags are like a woven synthetic material that can breathe and allow the moisture to escape. This is key since we want to keep them dry over the winter. I stuff the chicken feed bags with leaves and then force one down over each stump. 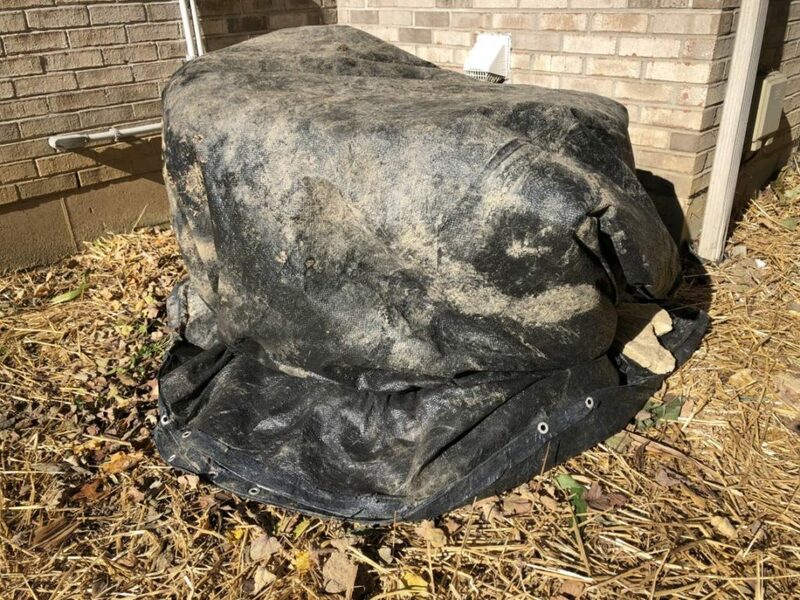 Then, I cover all with whatever I have… I have used oversized planting pots, a kids plastic swimming pool, and for the large groves, a tarp, and one patch just an upside down kids plastic pool for a larger patch. The idea is to keep them dry. They can get cold… but they can’t be cold and wet. By spring, you see the new growth that is literally pushing my coverings off the top. You can see below the shoots that were there upon uncovering. Just uncovered trees April 2019. Here’s a few shots of the trees at various states during the season. I’ve added captions to each for a little more perspective. Trees really ripping by June. A grove in the front planters. Size comparison of the girth they can get when cutting at the knees in the fall. Bananas hacked and ready to cover for winter. Note sucker in center. Tree just hacked at knee-height. This is then chopped up and added to compost. Trees packed with leaves and made to keep water off them. The trees here get taller than the house and can be seen from the front.